“I got a small Christmas tree, although it was impossible to find in the shops any of the usual trinkets to adorn it,” Eliot wrote in 1918, when the Great War was under way. 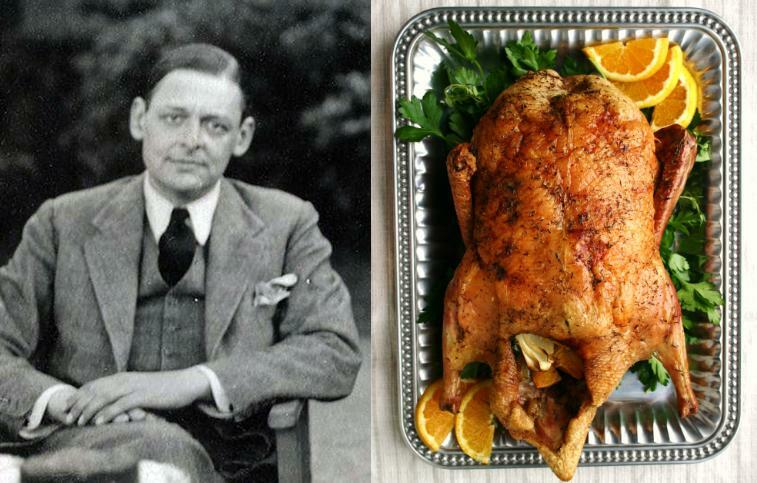 His most memorable meal, that canard aux oranges, is an ideal main course for this time of year, when cooking should have maximum impact for minimum stress. Compared with Thanksgiving turkeys, ducks are much more forgiving; at high heat, the fat under the skin renders into the meat, staying moist even when you’re roasting the bird whole. Although Vivien handled most of the heavy lifting in the kitchen, her husband would often whip something up for himself. Cleaning up was another matter. “My wife has just got back from the country and as I have been doing some cooking in her absence. There is some filth,” he wrote in 1917. Our significant others and poetic geniuses aren’t so different after all! Ask them to take care of the dirty roasting pan this year, as another intangible gift to you. 1. Place oven rack in middle position and preheat to 475°F. Stir together salt, coriander, cumin, and pepper in a small bowl. Pat duck dry and sprinkle inside and out with spice mixture. Cut 1 half of orange into quarters and stuff in duck cavity with thyme, parsley and 4 onion wedges. Spread remaining 4 onion wedges in roasting pan with carrot and celery, then place duck on top of vegetables and roast 30 minutes (it will crackle loudly). 2. 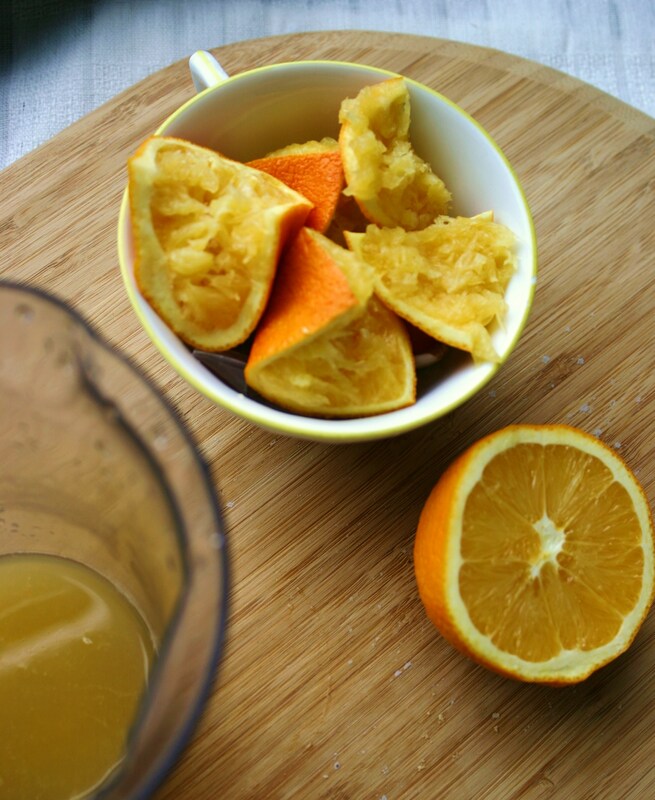 In a small bowl, squeeze juice from remaining half of orange and stir together with wine and stock. Pour wine mixture into roasting pan and reduce oven temperature to 350°F. Continue to roast duck until thermometer inserted into a thigh (close to but not touching bone) registers 170°F, 1 to 1 1/4 hours more. 3. Turn on broiler and broil duck 3 to 4 inches from heat until top is golden brown, about 3 minutes. 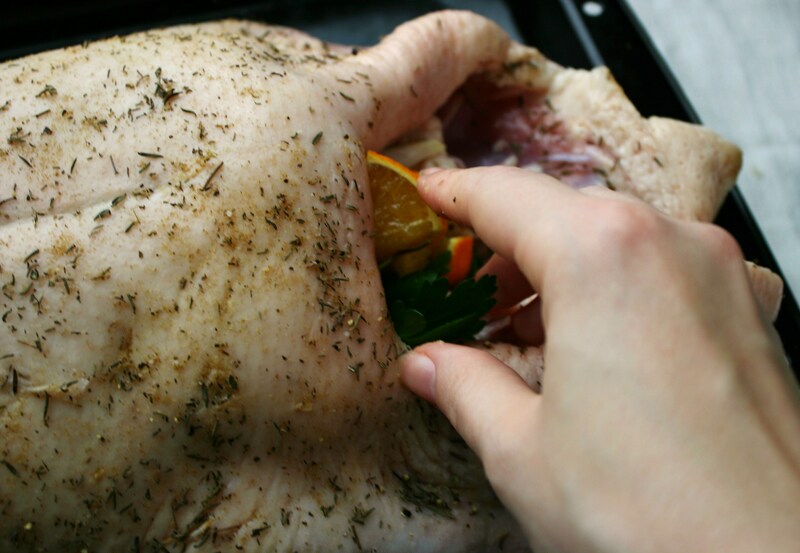 Tilt duck to drain juices from cavity into pan and transfer duck to a cutting board, reserving juices in pan. Let duck stand 15 minutes. 4. While duck roasts, cook sugar in a dry 1-quart heavy saucepan over moderate heat, undisturbed, until it begins to melt. Continue to cook, stirring occasionally, until sugar melts into a deep golden caramel. Add orange juice, vinegar and salt (mixture will bubble and steam vigorously) and simmer over low heat, stirring occasionally, until caramel is dissolved. Remove syrup from heat. 5. Discard vegetables from roasting pan and pour pan juices through a fine-mesh sieve into a 1-quart glass measure or bowl, then skim off and discard fat. Add enough stock to pan juices to total 1 cup liquid. 6. In a small bowl, cream together butter and flour. Bring pan juices to a simmer in a 1- to 2-quart heavy saucepan, then add butter mixture, whisking constantly to prevent lumps. Add orange syrup and zest and simmer, whisking occasionally, until sauce is thickened slightly and zest is tender, about 5 minutes. Serve with duck. Duck a l’orange is always a good festive dish. I’ve had some succulent ones and some horrible ones – it actually is possible to end up with dry tough duck, perhaps it depends as much on your duck as your cook! Being in Australia, I’m not sure that I’d have access to Long Island duck, but hopefully the Australian version would suffice. Great information on TSE … thank you. Have a happy Christmas. I don’t eat a lot of red meats, so to me duck is a go-to if I’m craving something really decadent. Having a good duck is key, though, and I’m sure there are some in Australia that fit the bill (ugh, no pun intended). Lovely. I hope to make this for New Year’s Eve. Thank you! What a perfect quote as we head into 2014 – a great pairing for this dish. Enjoy!